I encountered specific problem during work with PLC&HMI application. The main task of that system is controlling torque changes of induction motor with inverter&analog PLC output. There are few built-in functions to change torque: exponential, constant, trapeze and unlucky sine. All functions are implemented as array of 1500 values. When array reaches 1499 element, it comes back on first position and so on. It works without any problem for exp, constant, trapeze and sine wave with natural numbers of frequency e.g. 1Hz, 3Hz etc. The trouble appears when we want to control torque with float value of frequency and unfortunately its the most important part of that project. When the float value frequency is chosen, the last element of array is totally different than the first one. In result, in every period of array, appears drop of value. Check the attachments to comprehend what's going on. The first image shows GXWorks restriction of index. The second image shows how does it look on simulate screen, where it's representation of PLC registers D2000 - D3499. On third and fourth images you see values of registers in Device Memory Batch of GXWorks. Fifth image shows the script which I work on. Do you have any ideas how to implement float values of frequency in correct way? I should make an opportunity to online change of sine frequency in continuous way between 0 and 10 Hz, with 0.2Hz step. All functions are implemented as array of 1500 values. When array reaches 1499 element, it comes back on first position and so on. The index must start from 0, instead of 1. I changed index from 1 to 0, but still it doesn't work properly. I wrote another script, with same formulas and structure to fill registers starting from D3500 with same values as D2000-D3499 to show you better what kind of problem I work with. I extended simulating screen with additional window representing D3500-D4000. These little breaks are connections between screens. You can see that in D3500 register gets from script, array value no.1. 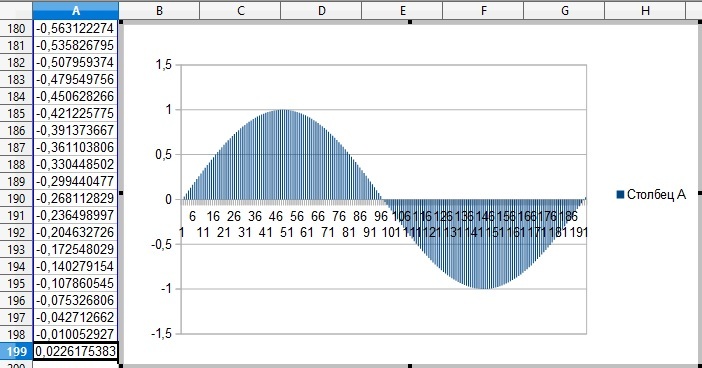 I would like to get continuous sine wave chart, so in D3500 value should be equal to 89. I guess the problem is putting sine function into array. It's periodic function, it doesn't need to be repeated. If we estimate function y=10*sin(t), it doesn't matter if we get t=1 or t=1000, values will still be between <-10,10>. Any ideas how to implement that idea into GTDesigner script or GXWorks ladders? Please could you describe everything concisely and clearly. Perhaps my bad English does not allow to understand what you are trying to achieve, but I doubt in it. What I have understand. You have an array of 1500 elements (D2000-D3499) whose data represents the instantaneous amplitude of a sinusoidal wave. When the array is filled with integers, everything is in order, the sine wave graph is completed. When the array is filled with real numbers, you get only a part of such graph, so you want to continue the graph by approximation. Is it so? What do you want to get in D3500-D4000 (501 elements of array)? The main goal of application is to obtain on PLC output mathematic functions. As I mentioned before, everything is correct with: constant function, trapeze function, exponential function. Every function is implemented as executable script in GOT + PLC blocks. Every function values have a place as registers in PLC's memory. I assumed that every function will execute in loop with 1500 iterations. First value - function_value is placed in D2000. The last one, function_value is placed in D3499. Between these registers are particular values, estimated from script. In picture 1 you can see one period of exponential function received from script. In real system, one period of function will execute during some time "t", e.g. t = 0.8 sec. So if we have 'task time' = 20 sec, function will repeat n times. In picture 2 you can see torque and current measurements from NI DAQ during control with exp function. In sine wave function, user can decide about: amplitude, offset and frequency of function. A trouble appeared with frequency. I should obtain sine function which is repeatable every "t" time, depending on frequency entered by user. If we meet with situation like in picture 3(sine with f=1,4Hz), repeating of such function will cause deformed chart, so its useless. I worked with script showed on picture 4, but maybe its concept is bad? I wondered about line 4 in that script, I am not sure every index of function should be multiplied by coefficient = 2pi/no of elements? I have an idea but have no clue at this moment how to accomplish it. ...Or just quit present concept of script and make a new one to receive in analog output sine function with online changing of its frequency. I really hope this time you could understand better nature of the problem. P.S. To clarify your doubts - yes we have array of 1500 elements between D2000 and D3499. These data represents one period of some function, when its constant, it will be one value stored in each of 1500 registers, when its sine, its gonna change between <-A,A> where A is amplitude. Array is always filled with integers because I send to D2000 data type "word". There is no approx of values. In registers D3500 - D4000 I stored the same values as in D2000 - D2500 to show you in clear way that repeated chart will be deformed (in good case values between e.g. D3495 and D3505 should be similar to smoothly continue shape of sine wave). Now is clear what do you need) Pls, give me a time to think, it's not an easy task. plat993x, what the model of PLC do you use? It's Mitsubishi FX3GE-24MR with GXWorks 2 software. The HMI is a Graphic Operation Terminal 1000 Series, GT15 wih GTDesigner 3. Hope, now you and your top-brass are aware that a choice of FX3G for the current application was wrong and the FX3U should be used. How I'd solved the problem, using FX3G and not using array... I'd calculate in PLC the instanteous amplitude of the sine wave using Taylor series, i.e. sinx = x - x3/3! + x5/5! - .... in each scan or with a time interval according to DAC operational time. 1) For that purpose is need to accumulate a scan time, i.e. at each scan is need to add a time of previous scan, which is stored in D8010 (0,1ms units). 2) The accumulated value (DINT) is need convert to into REAL then to multiply with Frequency value [0,1Hz units]. 3) Because a time value is represented in 0,1ms and a frequency value is represented in 0,1Hz it is need to compare the result with 100000 (the equivalent for 2*PI angle). If the calculated value is greater than or equal to 100000, then is need to reset the accumulated value of scan time. 4) The result of previous calculation is need to multiply with 2*PI/100000. Thus we get x-operand. 5) The result of previous calculation is need to multiply with itself to get x2. The result of this operation is important to save separately of x, both and of other values, because it will be used in following calculations. 6) x2 is need to multiply with x and the result to divide with -6. Thus we get -x3/3! and can add it to x. Thus we get a x - x3/3! in the cell, where x stored. 7) -x3/3 is need to multiply with x2 and to divide with -20. Thus we get x5/5! and can add it to x. Thus we get a x - x3/3! + x5/5! in the cell, where x stored. 8) Then the result is need to multiply with the signal amplitude (the digital value that should be transferred to the channel of analog output module) and finally to convert it into INT. P.S. Steps 6 and 7 can be implemented in a loop format, using a table of dividers. In this case -x7/7! , x9/9! etc. 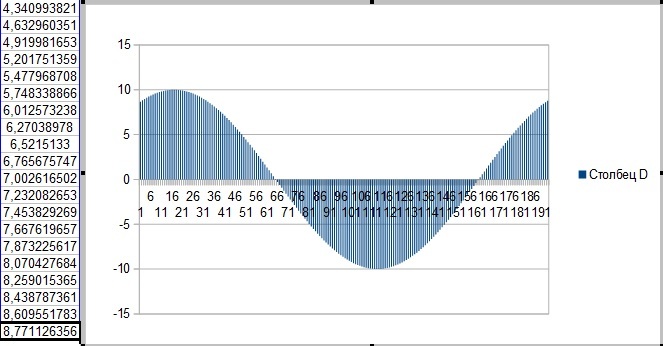 can be easy calculated to provide a higher accuracy of sine wave calculation. The algoritm requires only 8 registers (4 REAL). What it gives? If the Freq and Tscan values are predefined, the k and Xi-2 can be precalculated by usual calculatator. After that the calculated value of sine wave amplitude can be scaled for AO. Huge thanks to you for interesting in this issue and your efforts. I will try to implement each method and gonna see if it does work. If you get some new idea please share it here. No, have not a new, i've thoughly tested this algorithm and it works fine. But you can implement this initial calculation with HMI script. Generally, how to calculate the instant amplitude of a sine wave in scanning. The instant amplitude of a sine wave at the current scan is stored in Xi-2. How to implement a SIN calculation using a Taylor series is shown there . "1) For that purpose is need to accumulate a scan time, i.e. at each scan is need to add a time of previous scan, which is stored in D8010 (0,1ms units). What I wrote in a wrong way? Can you see some obvious mistakes in my code? Ahead on the question "data types: word vs float", when I wrote code on floats as you recommended, I received some noises between -32768 to 32767. After that I changed floats to word and received chart like in attachment 2. It looks more like sawtooth. Did I make too less polynomials in the formula for Taylor series(now it's y = x-x^3/3!+x^5/5!)? I wondered about scan time of PLC, what do you think, is it possible to change scan time with M8039 and register D8039 to achieve changing of frequency of sine in much simplier way - regarding to attachment 3 and 4? For example when I use sine wave function with 1 Hz frequency and scan time D8039 = 100ms, changing value of D8039 from 100 ms to 200ms will change frequency on 0.5 Hz? Let 'begin from the end. Yes, when I say about a constant scan time I mean the D8039. The value of D8010 is measured in 0.1ms units, while the D8039 is meaning in 1ms. Thus, if the value in D8039=100, the D8010 will be equal to 1000 and the scan time will take a 100ms. The scan time of 100ms is a too much value for the FX3 PLC series. A typical scan time is from 4 to 10ms, and the abovementioned values is valid for programs with greatly complex algoritms. Also, if you are set a scan time as 100ms, for the 1Hz frequency of sine wave you'll just get 10 points of curve... (in case of 0,5Hz you'd just get 20 points). Did I make too less polynomials in the formula for Taylor series(now it's y = x-x^3/3!+x^5/5!)? Yes, for a quite high accuracy the polynom should has at least 4 elements, i.e. sin(x)= x - x^3/3! + x^5/5! - x^7/7! . Why? When x is in the range of -1<=x<=1, the maximum approximation error is 1/9! = 2,76*10^-6, i.e. is less than 0,0003%, while with 3 elements the maximum error is 1/7! = 0,02%. Don't use the first algorithm of sine wave calculation, proposed by me! At 2*Pi angle the approximation by Taylor polynom using 5 elements will give a value (2*Pi)^9/9!=42 and the error about 350%. I strongly recommend you to use the second algorithm of sine wave calculation, proposed by me. As I said already, in contrast to D8010 the D8039 is represented in 1ms value. Pls, take it into account! Also you should remember, that if the scan time will be set as 10ms, at the mentioned 10Hz, you'll get 1/(10Hz*0,01s)=10 points only. At 1Hz you'll get 100points. With 4ms scan time at 10Hz you'll get 25 points, with 2ms scan time - 50 points of a sine wave amplitude, and with 1ms scan time - 100 points. dAngle = Pi*FLT(D8039*Freq)/-5000 , if the Freq is represented as INT in 0,1Hz units. Because the D8039 is set by you, you just can use a constant instead of register value. Then value of xi-2 can be converted into INT to sent it to the assigned channel of Analog Output Module. That's all that you need to do. Okay, I started implementation with help of your last post. I will try to ask you with some doubts to avoid unnecessary corrections and getting lost in a code. In attachment 1 you can see a code with dAngle, k, and Xi-2 and Xi-1 variables. Later, I assigned these values into PLC's registers with 5 registers break. Is it written in a good way? Should I put some while loop here? If it's true, where should I put index in? The second part was to make a new network in PLC program which is showed in att.2. Is this ladder combination made good? What I observed so far is issue that "REAL_TO_DINT_E" block does not convert values 4.371144 into 4. What is more, 'Sinewave' network in POU part of program is coloured red after compilation. Do you see there: in HMI code or in PLC ladder some obvious mistakes made by me? Not sure if it's really challenging task or I'm still serious newbie in PLC&HMI stuff... Pls help. 1. To the PLC it is necessary to transfer only three values: k, Xi-2, Xi-1. This should be done just ONCE , BEFORE the sine wave calculation. 2. To provide the requirement of item 1 you should not use a PLC input to activate the command sequence, a marker has to be used for this purpose. 3. Check carefully the predefined values calculations in HMI. The k value must be positive, and the xi-2 value must be negative! 5. Decrease the value of sine wave frequency (52,4 is too high), increase the amplitude of sine wave, otherwise in the analog output you get a direct line, instead of desired sine wave.